Organizers of the protest say construction of the new jail, which is underway, would "uphold racist systems and strengthen the school to prison pipeline." 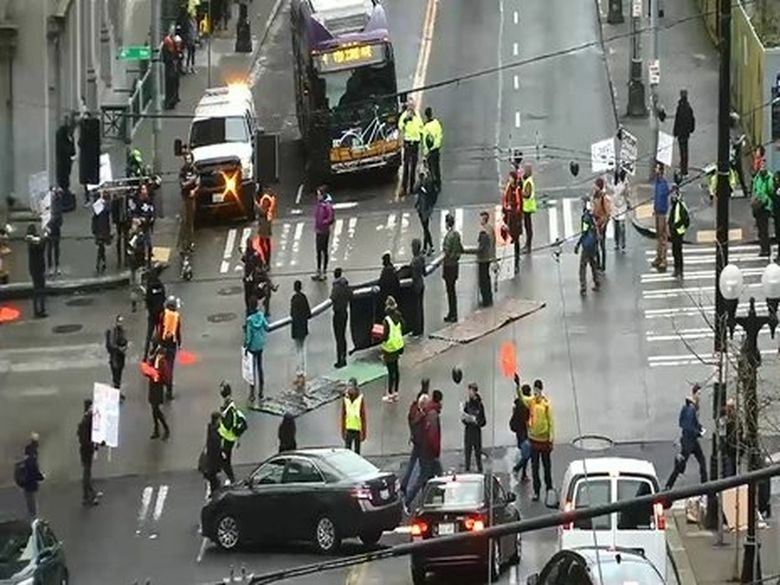 Opponents of King County’s efforts to build a new youth jail blocked several intersections during a downtown Seattle protest that lasted about six hours Friday. 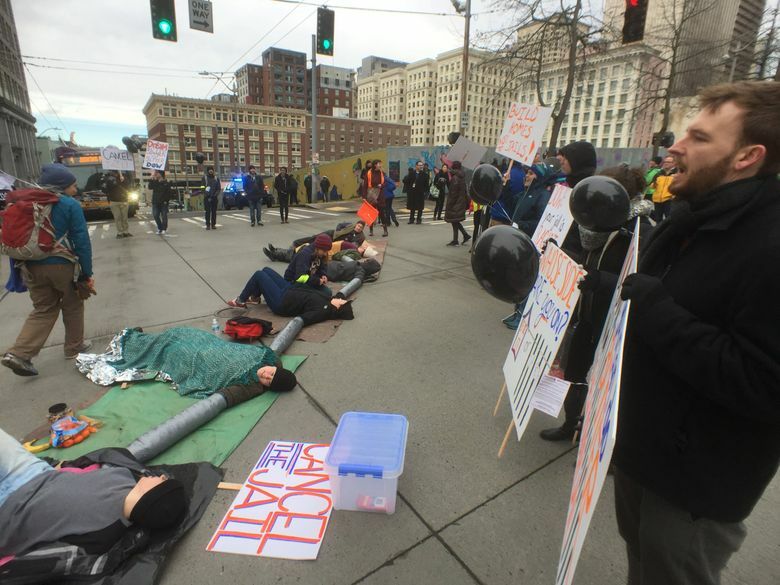 Some protesters linked their arms with piping and lay in the intersection of Fourth Avenue and James Street from about 8 to 10:45 a.m. 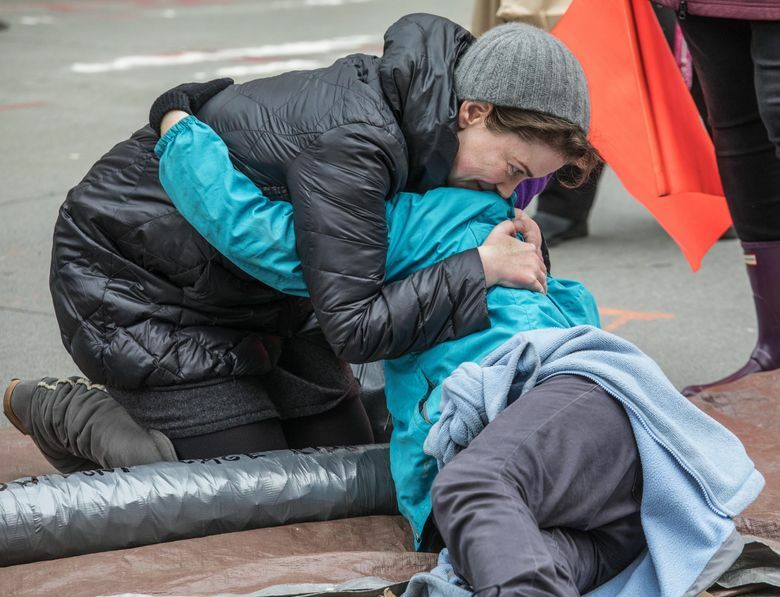 They and others, about three dozen in all, then began marching north to Fifth Avenue and Stewart Street, where they stopped and some lay down again on cardboard and tarps. 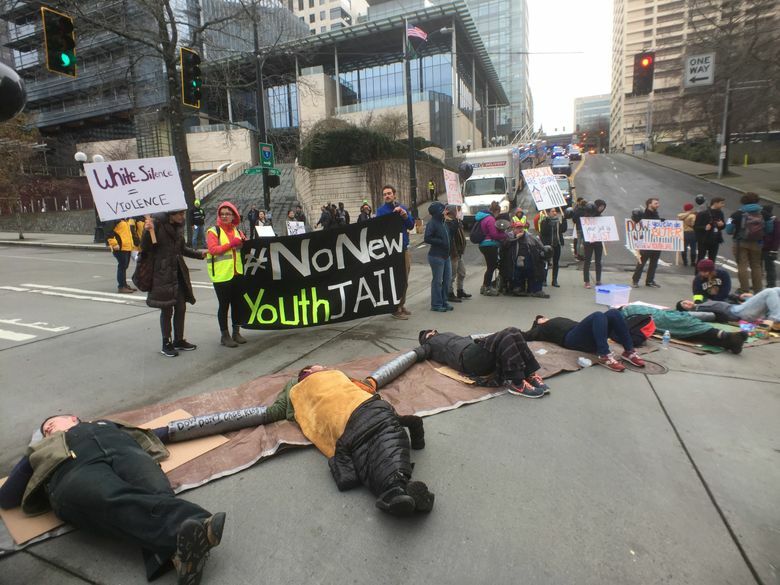 Protesters blocked the intersection, near McGraw Square, under the monorail, until about 2:15 p.m.
Julianna Alson, a spokeswoman for the No New Youth Jail Coalition, said construction of the new jail would be tantamount to a commitment to more youth incarceration, especially among minorities and people of color. 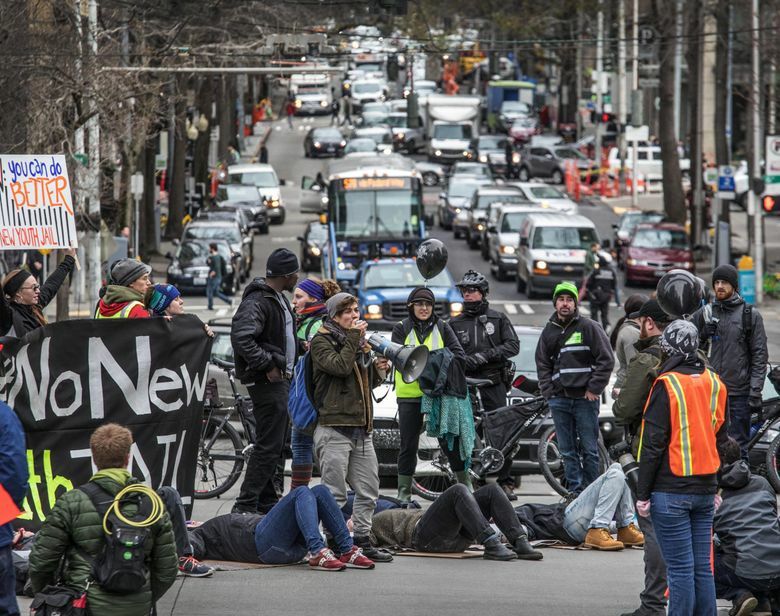 The Seattle Department of Transportation warned motorists to avoid the protesters. 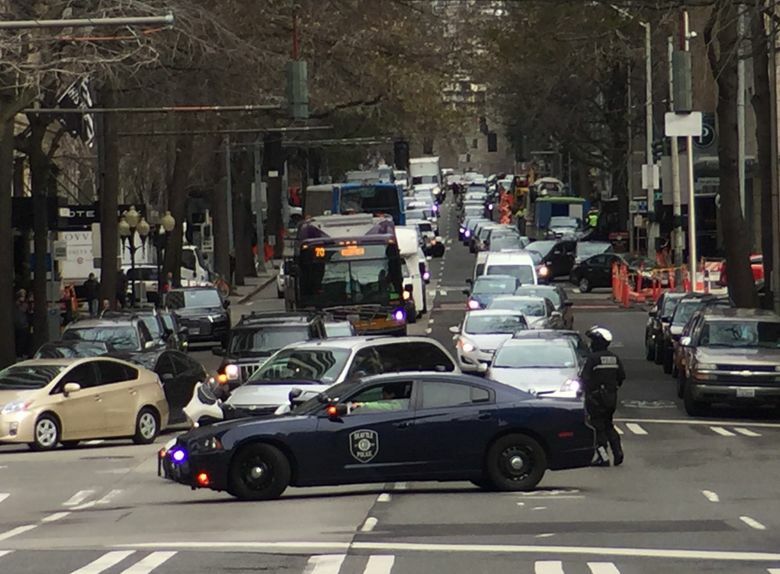 Traffic was backed up on surrounding blocks and on Interstate 5 and 90. 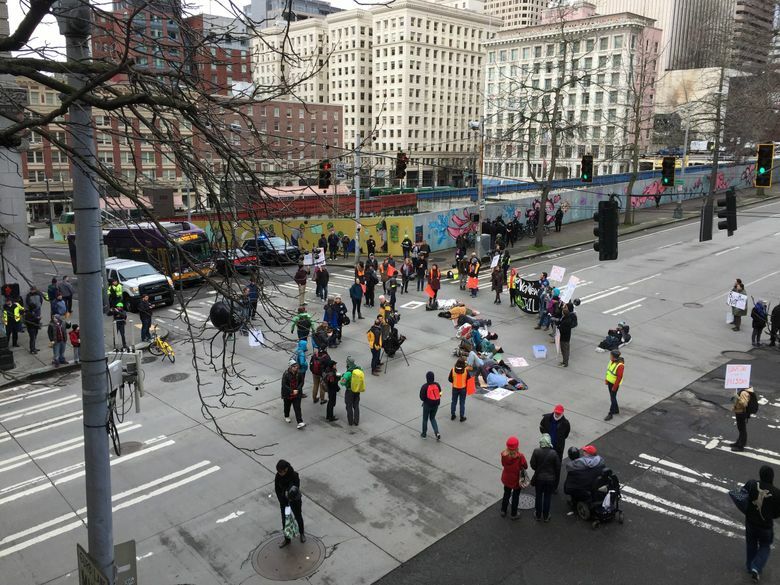 King County Metro reported “significant delays” on bus routes through downtown. 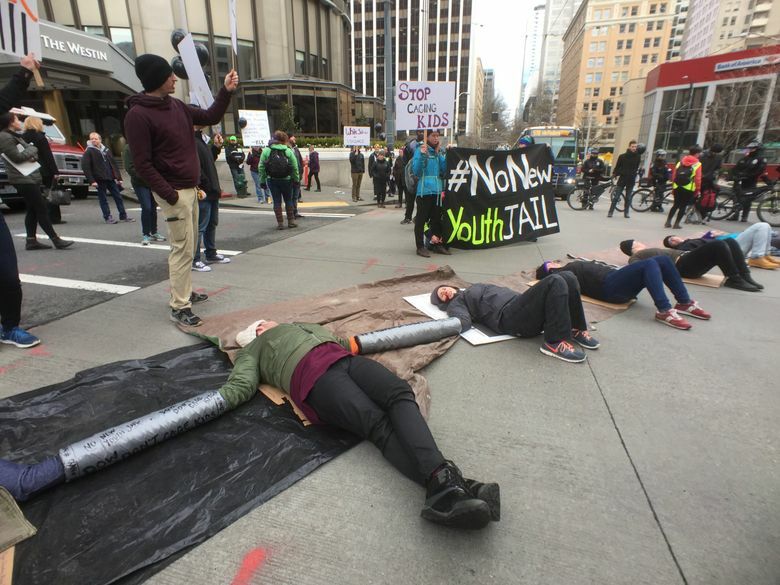 Protesters said they shut down the street to send a message to King County Executive Dow Constantine demanding he immediately halt what they called the unlawful construction of the youth jail and court complex. The protesters were overwhelmingly white, which was a conscious decision, said Alex Brott, one of the organizers. 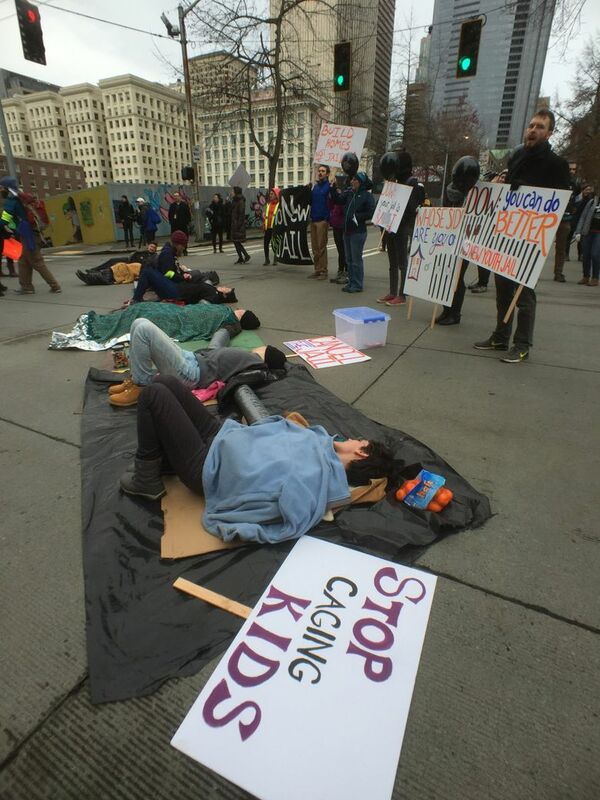 Constantine’s office issued a statement Friday afternoon, saying that King County has reduced the juvenile population by 70 percent over the past 20 years and is committed to reducing it further. “We are innovating with new alternatives to detention such as Family Intervention and Restorative Services (FIRS) — programs proven to divert youth of color from the justice system and toward supportive programs and mentors,” the statement says. Rachel Smith, Constantine’s chief of staff, arrived to speak with protesters shortly before 2 p.m.
“We are committed to zero youth detention, we are committed to a public health approach to juvenile detention and we want to work with all of you in getting there,” Smith said. But she was quickly shouted down by protesters, and similarly drowned out by protesters when she attempted to speak to the media. 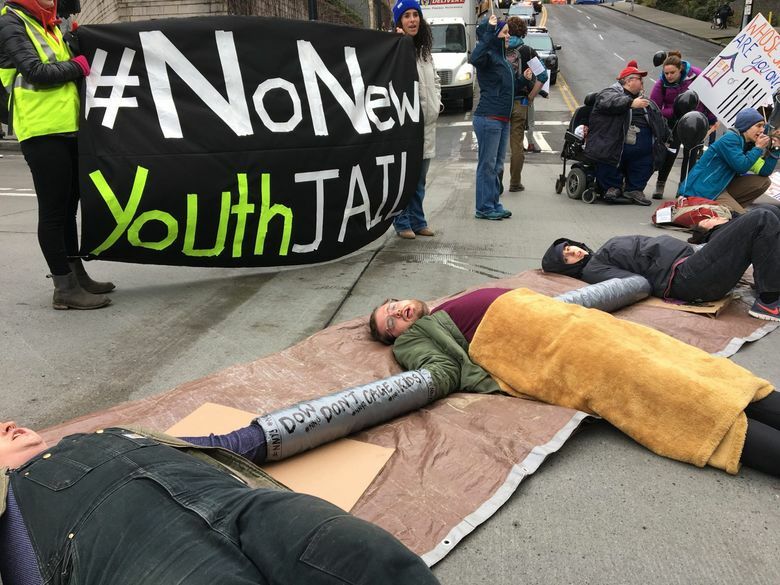 In a news release, organizers said they have been “fighting a vital battle in the courts and on the streets” to stop construction and pressure the county to adopt a zero-detention goal for youth. 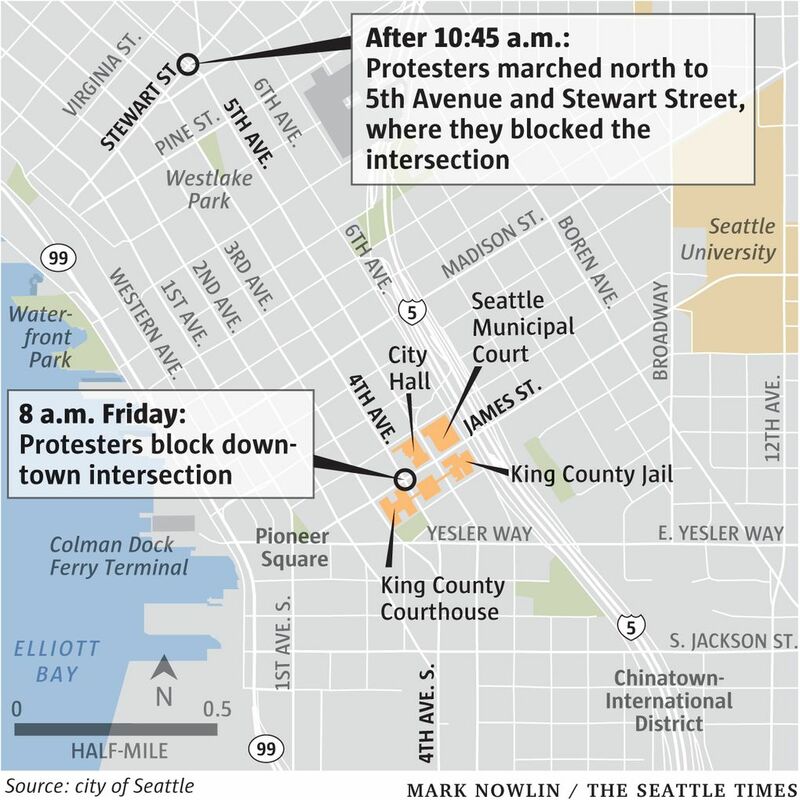 County voters in 2012 approved a $210 million levy to pay for a replacement for the existing juvenile-justice complex at 12th Avenue and East Alder Street in Seattle’s Central Area. Construction has begun on the facility. 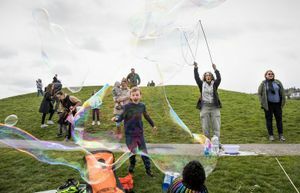 In September, King County said it planned to appeal to the state Supreme Court an appeals-court ruling that found voters were provided flawed language on the funding mechanism when they approved a ballot measure to build the new Children and Family Justice Center. 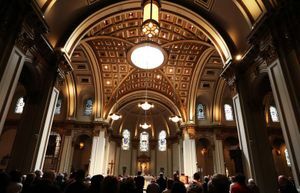 The appeals court rejected another claim by opponents, agreeing with King County that the purpose of the levy was made clear to voters. The county has reduced youth detention by nearly 75 percent in the past 10 years, but more than 50 percent of incarcerated youth are black despite making up 10 percent of the county’s population, the organizers said. Friday’s statement from Constantine’s office said King County petitioned the state Supreme Court in December to review the appeals-court decision. Alson, one of the protest organizers, said it was successful.